That’s the secret to creating a blog that thrives. Despite what you might think, being new doesn’t mean you can’t gain a deep understanding of your audience. It simply means you need a different approach to get there. Because while a more established blogger can simply run a survey, when you’re starting from zero that’s not an option. You may have a vague idea of who you’re writing for, but not know exactly what they want to read about. How do you get to know an audience you don’t actually have yet? Funnily enough, you do need to make some assumptions. But then you need to test those assumptions in the real world and to build an accurate picture of your target readers. Too many new bloggers jump in without having the faintest clue as to who their target audience is and what they want. But that barely scratches the surface. It’s too broad to be truly useful. Sarah is a full-time working mother of two children under the age of six. She wants to earn some income on the side to help with the household expenses. Lately she has been reading up on freelancing, but she doesn’t know where to start. She is toying with the idea of starting a blog, but she’s not sure if she has the time for it, especially with her kids. She fears that she is not an expert on anything in particular and doesn’t know what to write about. She never misses MarieTV episodes on Tuesdays and tries to learn as much as possible about writing from Carol Tice’s website Make a Living Writing. She relies on Facebook to keep up with the latest news during her lunch hour. Until you ground your profile in the real world, you’re still wearing that blindfold and throwing those darts. The truth is that without research your reader “profile” is just an educated guess — a hopeful description of the sort of person you want to attract. Sure, writing for “Sarah” may be a great cure for writer’s block, but what if there aren’t enough Sarahs to build a popular blog around? Or what if your ideal reader in the real world — the one you can serve the best — matches a completely different profile? How do you ground your theoretical ideal reader in the real world? Well, that’s what this post is all about. It’s a series of steps and handy tools that will tell you everything you need to know so that you can write like you’re inside your readers’ heads. But before we dive into those steps, let’s briefly look at the main components of a reader profile. Taken together, these questions will help you understand at a deeper level the type of person you want to attract and influence. You won’t have to lurk for hours in comment threads to get this information, but you will finally feel that your target audience is more fact than fiction. So let’s look at the six steps that will help you zero in on your target audience and set you miles apart from the majority of new bloggers still fumbling in the dark. Right now you may only have a vague idea of who you want to write for and who would benefit most from your blog. For instance, you may have a sense of your target reader’s gender, age range and likely topics of interest. And that’s fine as a starting point. But how do you gain a better understanding of your audience — and how do you find them? The answer is, through your competitors. Remember, your target readers aren’t waiting patiently for your blog to appear on their radars. They’re already visiting other blogs that serve their interests. 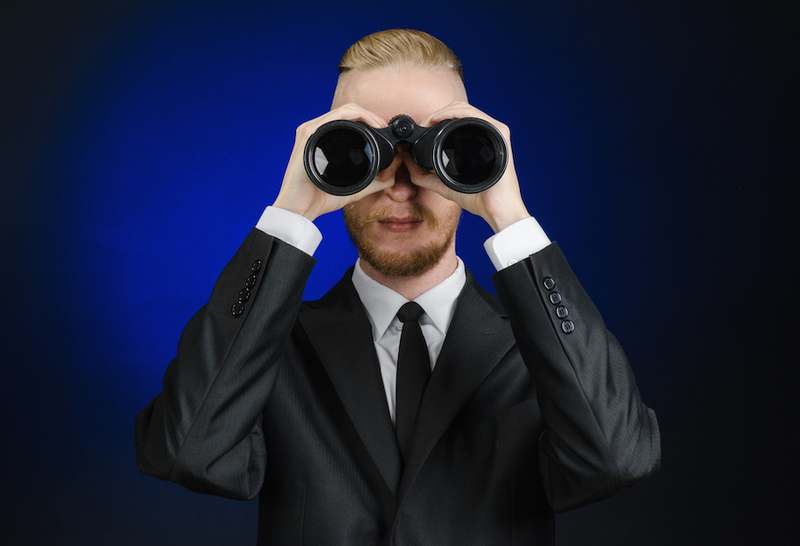 So you have to discover your competitors — the blogs your future audience is already reading. If you’ve been lurking around the blogosphere for long, you should have a pretty good picture of your main competitors, so make a quick list now. If you haven’t the faintest clue, or your need help topping up your list, here are a couple of ways to do it. Alltop.com is a directory that curates the best blogs in almost every subject imaginable, and it’s a great first stop when looking for competitors. Alltop categorizes thousands of blogs using hundreds of different topics, and you can easily find the relevant categories to your blog by using the search feature. 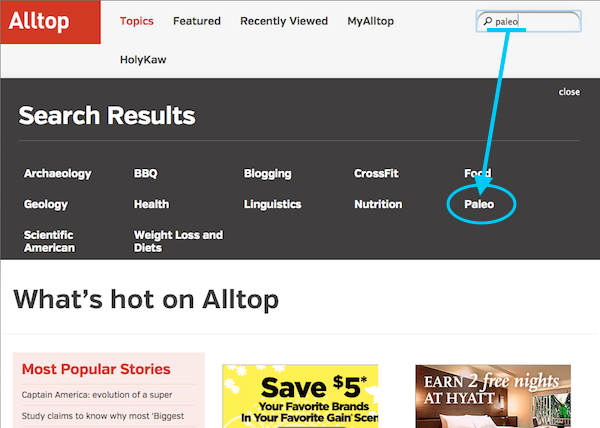 In this case there’s a direct hit — Paleo is one of Alltop’s topics — but often you’ll only find related, not exact, topics. Briefly visit the blogs you find and add any that look promising to your list of potential competitors. Think what keywords your target reader might use to find relevant blogs, and use Google to find the blogs that will compete with yours for those searches. Chances are that some of the results will overlap with blogs you’ve already found, but you should find some new ones, too. After completing these steps, you’ll have a list of possible competitors. But not all of them will target the specific audience that you want to target. Some blogs will attract your exact desired audience while others will be off-target in some way. So how do you know if a blog is a real competitor? One quick and dirty way is to check out the front page of each blog and make a snap judgement to eliminate any that are unlikely to appeal to your audience. However, if your target audience is primarily men looking to build strength from a “caveman” diet, this blog won’t be a good fit. Once you’ve done a simple cull, you can get a little more scientific. To further filter your list of competitors, you’ll need to dig a little deeper and learn about the people who visit those sites. Alexa is a fantastic source of competitive intelligence. It has a paid version, but the free one is more than sufficient for our purposes. Once you click “Find,” Alexa retrieves a host of useful data. This information should help you sieve through your list of potential competitors. If a blog’s audience falls within your target demographic, keep the blog on your list, otherwise cross it off. However, audience demographics are not the only useful data that Alexa can uncover. It also shows the percentage of visitors from different countries that visit your competitors’ websites, highlighting the top few countries in green on the map. In this case, most visitors are from the United States, but there’s a sizable presence in Canada, India and Australia as well. Bonus tip: If you decide to run Facebook ads to reach your audience, this gives you lots of useful targeting data. If you scroll further down, you can see the most popular keywords that drive traffic to the site. These are words and phrases that people are typing into search engines to find it. If you don’t think your target readers would be using these terms, that’s another good reason to remove a blog from your competitor list. Bonus tip: Depending on your niche, these keywords will also give you ideas for opt-in incentives. 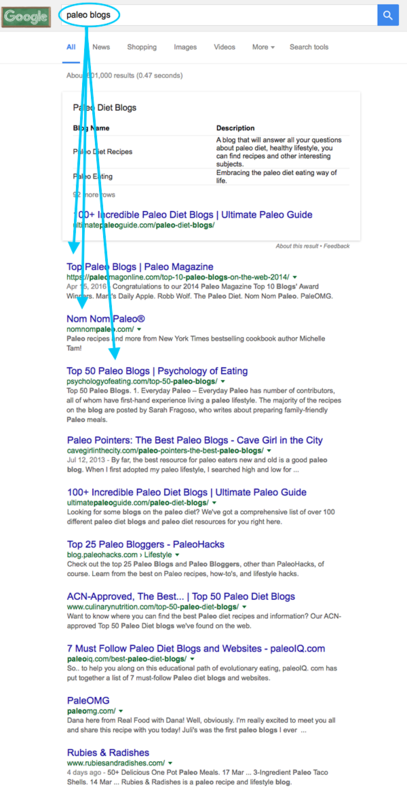 For instance, by looking at this list alone, you could have a variety of lead magnet ideas such as “5-minute Paleo snacks,” “10 fuss-free Thanksgiving Paleo recipes to impress your guests” and “20 Paleo meatloaf ideas for newbies.” It also gives you keyword ideas for blog posts. 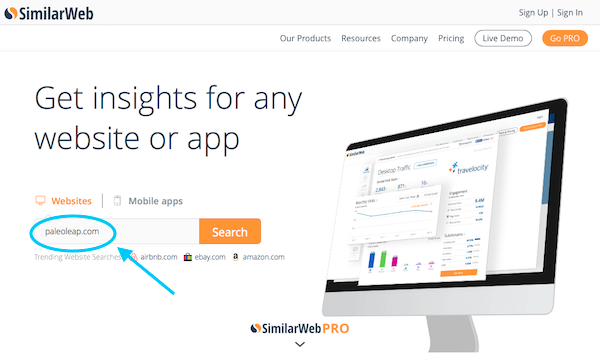 SimilarWeb is another analytics tool that has some valuable data for building your reader profile. 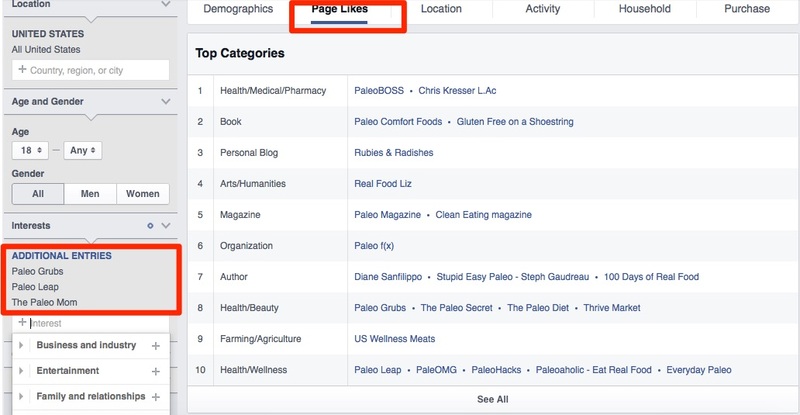 In this case, the majority of the social traffic for Paleo Leap is from Facebook, followed by Pinterest. Assuming this pattern was followed by the other sites on your competitor list, this gives you valuable information about what social media platforms on which to build a following first. You would also know on which platforms to share your blog post and status updates. 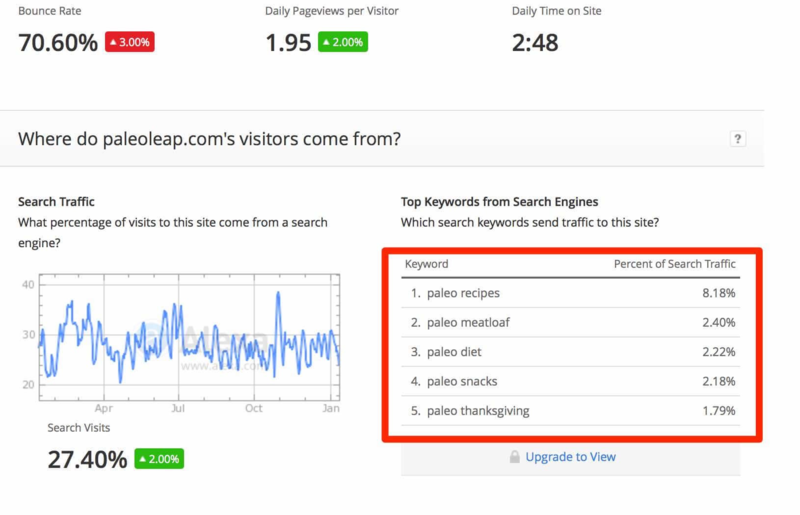 SimilarWeb also lists the top referring and destinations sites, meaning the sites the readers typically visited before and after visiting Paleo Leap. 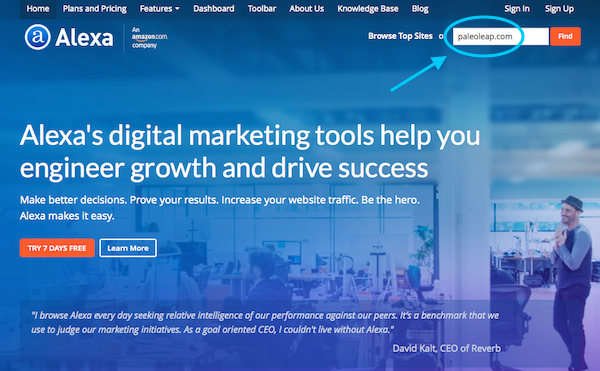 These sites may be useful ones to add to your list of competitors — or just to explore to get a better understanding of the topics that interest your audience. 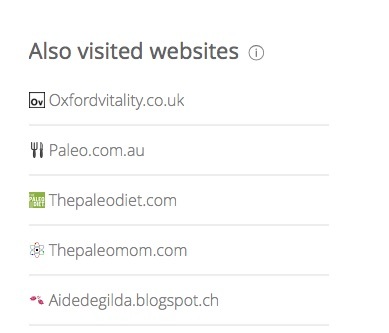 Underneath this information, SimilarWeb shows other websites frequently visited by Paleo Leap readers. This tells you more about where your target audience hangs out online and their website interests. 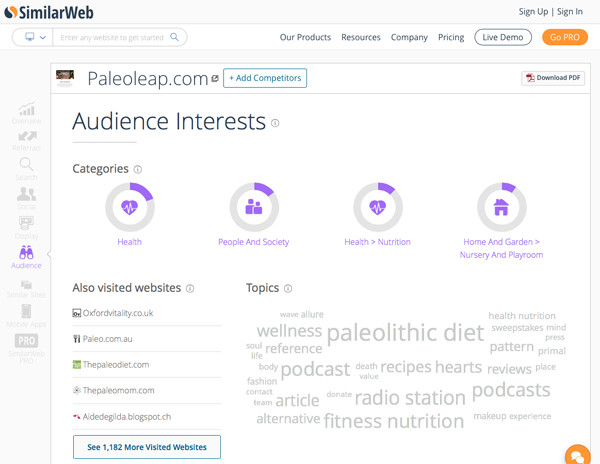 Finally, if you scroll further down, SimilarWeb shows you sites it believes are similar to Paleo Leap. Again, these are candidates for adding to your growing list of competitors. 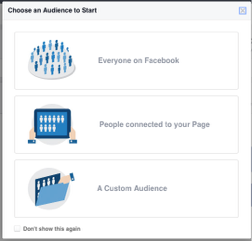 Facebook’s “Audience Insights” tool allows you to target specific interest groups with Facebook ads. Once you’ve logged into Facebook, the quickest way to access the tool is to follow this direct link: Audience Insights. On the next screen, you can use filters in the left-hand sidebar to “create an audience” based on your demographic profile. There’s also an “Advanced” field which allows filtering by other data such as relationship status, education and politics. Are more men or women interested in Topic X? What Facebook pages are like by people interested in Topic Y? What professions do people between 28 and 40 have who are interested in Topic Z? A great place to start is the “Interests” field. Try typing in the name of one of your competitor’s blogs. It should automatically show up in the drop-down menu if Facebook allows targeting of that page. If it doesn’t show up, don’t panic. Not all pages will show up on the “Interests” field. Try a different page. 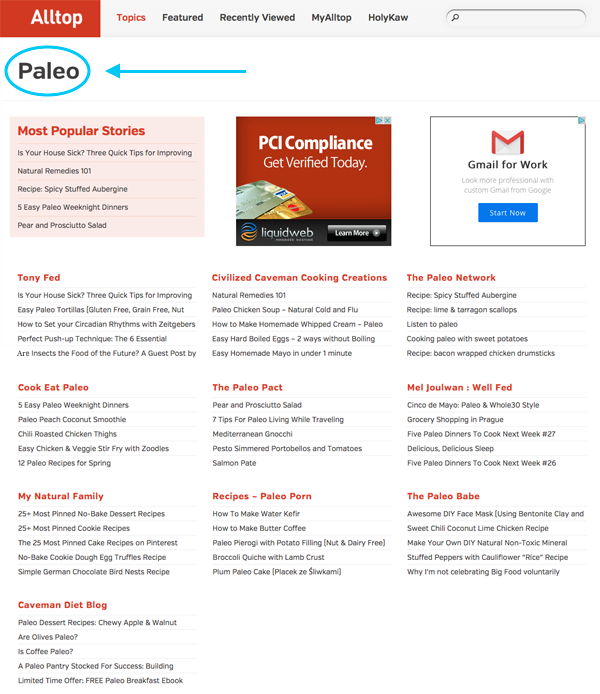 Here, I was able to add Paleo Leap. You can also add the other blogs in your filtered list to the “Interests” field. By clicking on the “Page Likes” portion on the top bar, you’ll see what blogs and magazines your target audience likes as well as the brands and personalities they follow. It’s not possible to do Audience Insights full justice here, but it has a wealth of valuable information if you take the time to explore. Facebook Groups are an invaluable source of data because they host real-world discussions by your target readers. 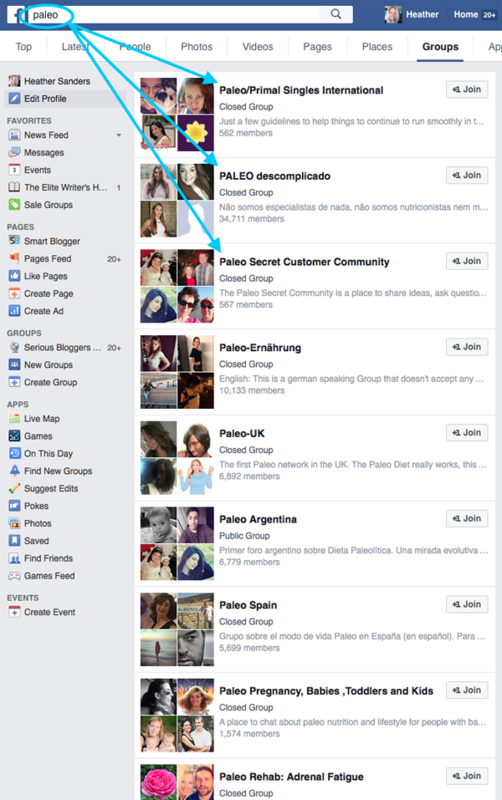 You can find relevant groups by typing your topic keywords into a Facebook search and then selecting the “Groups” tab. Some groups will be public, meaning you can see and search discussions without joining. Others will be closed, meaning you need to request membership first. These searches will give you a window on the problems that real people are having. This allows you to quickly zone in on your target audience’s pain points without spending hours scouring through the feeds. This exercise alone can inspire dozens of blog post ideas targeted at your ideal reader. Once you’ve found a few Facebook groups that seem to attract your target audience, you can finally run a short reader survey — even though you still don’t have your own audience yet! How you phrase your question and who you’re looking for will determine the quality of the answers you receive, so take time to craft your post. I’m in the midst of launching my blog, which is about [insert your blog’s focus and core message]. I’m looking for [insert target group — e.g., freelancers/designers] between [insert age range] who want to [insert target group’s key goal or desire] to answer a short survey. It won’t take up a lot of your time — I promise! In return, just to say thanks, I’ll be very happy to send you/help you with [insert your incentive — e.g., free meal planner, website review, blog critique, etc.]. Just to be clear, I won’t be trying to sell you anything. I just want to understand you guys better. You’ll get a better response if you offer an incentive in exchange for their time. And the incentive must be relevant to them. If you’re in a “travel hacks” Facebook group, don’t offer a guide on losing weight! Also, it’s a best practice to check with the group’s administrator to be sure such surveying is permitted. Most will allow it if there are no promotions or sales involved. Not sure what to ask in your survey? Check out the following post: The Surprisingly Simple Secret to Knowing What Your Readers Want. As well as clarifying your audience’s core motivations, this exercise will help you create drool-worthy openings for your posts. 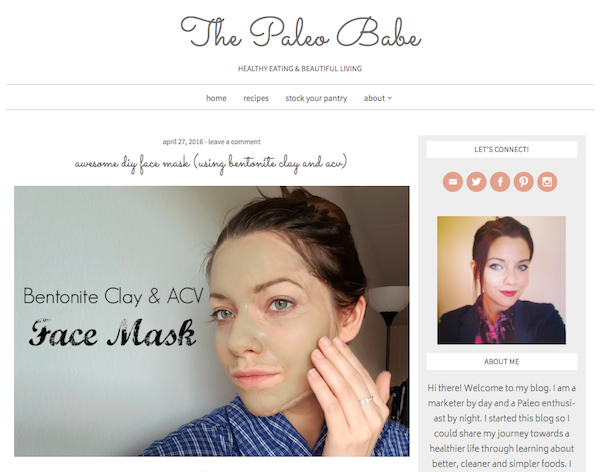 Being a new blogger doesn’t have to mean fumbling around in the dark to find an audience. Your future readers aren’t an abstract concept — they’re real people, with real interests and real goals. You just haven’t met them yet. The steps above will take your vague idea of an “ideal reader” and turn it into a simple profile that’s grounded in fact. Of course, you can keep wearing the blindfold and writing for a theoretical reader who may or may not exist. Or you can do a little work and give your blog a fighting chance of finding a real audience. It’s your choice. What will you do? About the Author: Meera is a freelance writer and tad bit of a nerd who loves supporting busy solopreneurs and bloggers find focus, build authority & stand out online. Struggling with what to write or send your email list? Steal her Swipe File of 2 years worth of content hacks for emails & blog posts. Download it here.